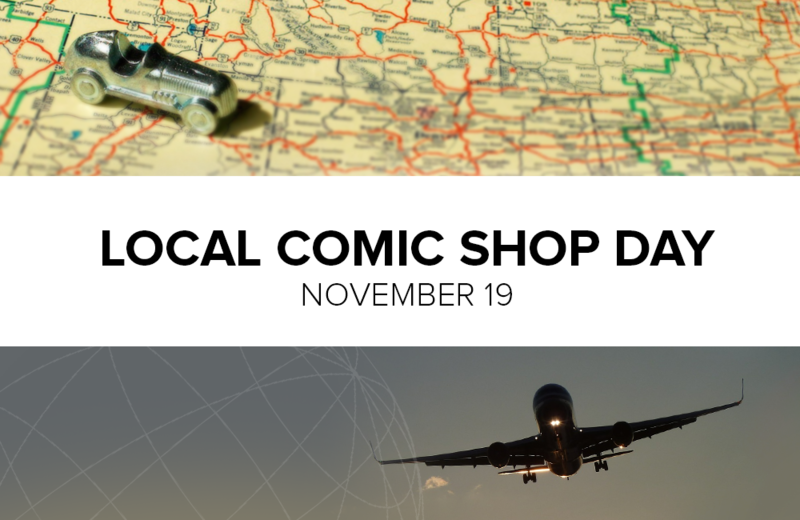 November 19th marks the 2016 edition of Local Comic Shop Day. In recognition of a day created to celebrate independently-owned shops, we want to share nine (yep, nine) favourite comic book shops from our travels and some of the shops on our list of places to visit. Two things set Atomic Books apart from other comic books stores you have been to: they have the best tagline with “Literary Finds for Mutated Minds” AND they are the official mailing address for John Waters’ fan mail. Atomic Books is a must-visit for eclectics and eccentrics. Their shelves are lined with graphic novels, art books, unusual figurines, and more. If Baltimore, MD isn’t on your list of places to visit in the near future, you should add it and make Atomic Books the first stop on your itinerary. Opened in 1977, Austin Books & Comics is Central Texas’ biggest comic retailer and a destination shopping experience. The store is large and so are the personalities that work there. This is a good thing. The environment is welcoming to all and the selection is sure to impress even the most avid comic consumer. Those who are new to the world of comic books and graphic novels will feel at ease in the store. In a city that’s hipper than hip, Austin Books & Comics is a breath of fresh air. Their staff doesn’t take themselves too seriously. They are a fun group of people who aren’t afraid to show their enthusiasm. Legend Comics is where those serious about comics and graphic novels go to indulge their interests. Located in in downtown Victoria, British Columbia, a short walk from the waterfront, Legend Comics offers a slightly more mature comic-shop experience than what is usually expected. Their collection of vintage comics and novels, back issues, and collectibles is top-notch and their staff is knowledgeable about the latest titles and the more obscure offerings. Not far from Union Square you’ll find local favourite, Forbidden Planet. In a city that has no shortage of great comic book stores, Forbidden Planet scores major points for its variety of offerings. They stock comics, action figures, posters, DVDs, games, magazines, and more. You’ll spend a lot of time looking up. Their selection is impressive and reaches the ceiling in some areas. Don’t let the scene fool you, the store is very well organized and locating items is never an issue. Is Mile High Comics’ Jason Street Mega Store America’s largest comic retailer? It just might be. Housed in a huge warehouse, the Mega Store is just one of chain’s three Denver-area locations. The store’s are home to a huge inventory of new comics, back issues, and pop-culture oriented merchandise. They are also known for their auctions, book signings, and gaming events. A true paradise for comic book fans. Be warned: if you visit their Mega Store, you’ll want to set aside a good chunk of time so you won’t be rushed. I’m going to go out on a limb and presume that most readers of this post wouldn’t consider Reykjavik local to them, but perhaps a visit to this Nordic paradise is on your wish list. As one would expect, Nexus offers a different mix of items than many of its North American counterparts. Along with the usual comic book shop offerings, they stock a large selection of rubber masks, plastic swords, and unique headpieces. If you do find yourself fortunate enough to visit Reykjavik, a visit to Nexus would be the perfect end to a day of visiting volcanoes, geysers, and hot springs. Spain is always a popular place to visit during the cold, dreary months that many of us experience in the eastern parts of Canada and the US. Visiting comic book shops while travelling is always a fun way to be immersed in local culture. Like many elements of Spain, Norma Comics is colourful. The walls are brightly painted in colours that complement many of the comics and graphic novels offered in-store. Visitors to the shop will find a good selection of American publications along with many European titles that would be hard to find elsewhere. Named after the classic comic book series, Strange Adventures is the place Maritimers rely on for their fix of superheroes and supervillans. Known for its eclectic mix of comics, graphic novels, and merchandise, visitors to Strange Adventures can always rely on the staff for great recommendations and honest opinions. There was a time that suburbanites of Ottawa West would have to venture out of their neighborhood for a great comic-shop experience. That’s not the case anymore. Wizard’s Tower in Barrhaven offers a huge selection of comics, graphic novels, toys, and games. The store well-staffed with comic book and gaming enthusiasts. They even host game nights and will happily teach you the basics of Magic: The Gathering so you can find out for yourself why an estimated 20 million players worldwide are so obsessed. Although many of these shops may not be in your local area, they are certainly worth adding to your list of places to visit. Billed as a science museum, the Museum of the Bizarre in Wilmington, North Carolina is home to a selection of oddities that inspire curiosity, wonder, and skepticism.